One of the most commonly used formats in Microsoft Excel is dates. 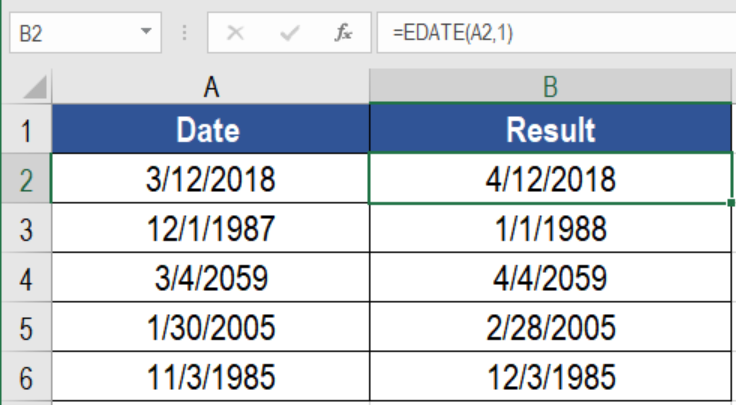 Over time, Excel has added some very cool features regarding dates. One such feature is to get the same date next month. We can do it using the EDATE function in Excel. In this tutorial, we will learn how to get same date next month in Excel. 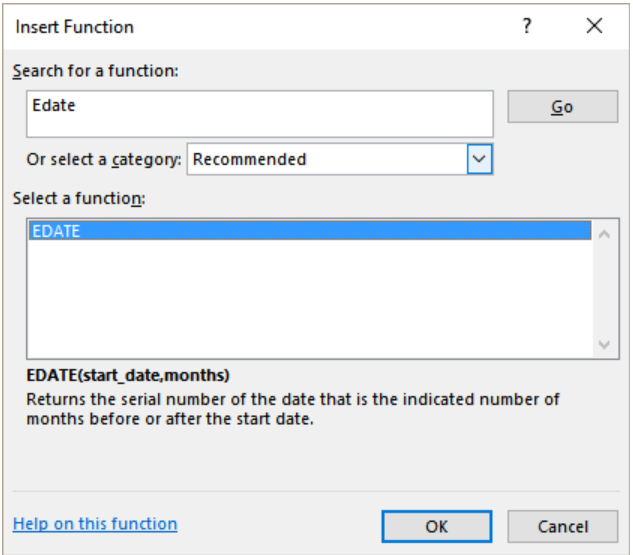 The EDATE function can generate same date next month. It uses two arguments: start_date and months. To get the same date in the future, we need to provide the date as start_date. We need to use 1. This will generate the same date next month. The following example contains some sample dates. They are in column A. We need to go to cell B2. Next, we need to go to Formulas>Insert Function. 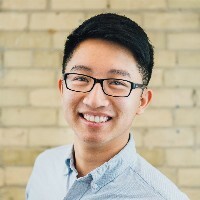 In the search for a function box type EDATE and click Go. In the select a function box, we need to click on EDATE and press Ok.
Next, we need to input the arguments. 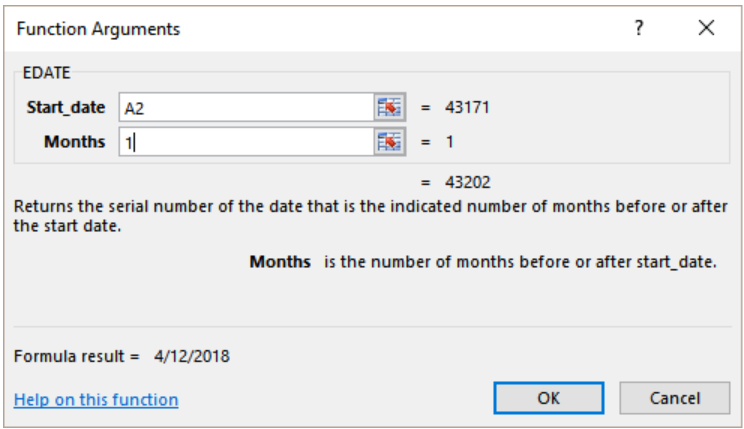 For the start_date we need to insert A2 and for months we need to type 1. Lastly, we need to click OK. We need to drag the formula using the fill handle from cells B2 to B6. This will show the same date next month in column B. We can also find the same date previous month. 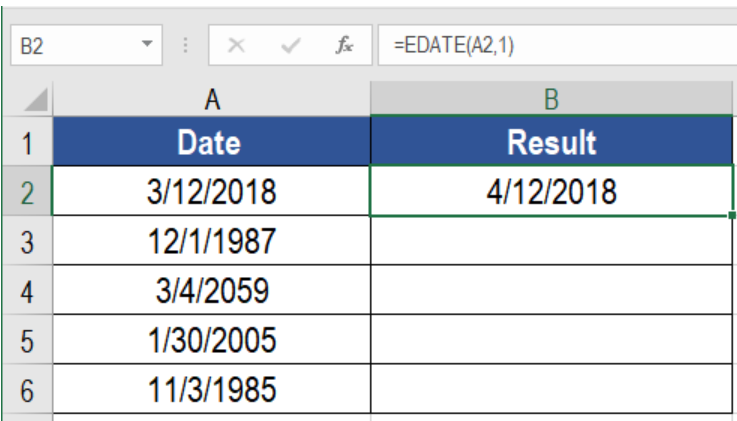 To find the same date previous month for the last example, we need to assign the formula =EDATE(A2,-1) to cell B2. This will show the same date in the previous month in column B.
Hi there, I need to create an if formula to calculate the below: Anything prior to todays date I want "YES", anything in the next month I want "DUE", anything past next month I want "NO". Trying to calculate date of eligibility (DOE) and corresponding code based on several inputs Date of Hire(DOH), Plan Start Date, Date of Termination (DOT) -if entered and whether or not the DOE should start mid month or at the start of the next month. I have a sheet with transaction for a month. Each month I get a new transaction sheet. I need a pivot table to calculate the total transactions for each day. However, before that, I need VBA/Macros to add in the date next to the qty sold, it is currently placed next to the receipt#.